This anthology reconsiders crucial aspects of abstraction's resurgence in contemporary art, exploring three equally significant modes or strategies explored in current practice: formal abstraction, economic abstraction and social abstraction. In the 1960s movements as diverse as Latin American neo-concretism, op art and 'eccentric abstraction' disrupted the homogeneity, universality and rationality associated with abstraction, opening up new forms of engagement with the phenomenal world and the possibility of diverse readings of the same forms, ranging from formalist and transcendental to socio-economic and conceptual. 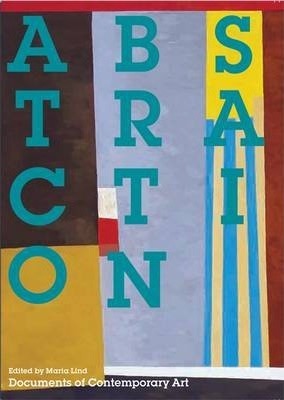 A second discourse that emerges in the 1980s via the writing of Peter Halley, Fredric Jameson and others, engages with abstraction through the consideration of an increasingly abstracted world in terms of its economic, social and political conditions - all increasingly manifested through abstract codes or sites of style. Such economic abstraction is primarily addressed in art as a subject or theme, but in Deleuze and Guattari's notion of art as abstract machine possibilities emerge for art's role in the construction of a new kind of social reality. In more recent art a third strand emerges: a form of social abstraction centred on the strategy of withdrawal. Social abstraction implies stepping aside, a movement away from the mainstream, suggesting the possibilities for art to manoeuvre within self-organized, withdrawn initiatives in the field of cultural production. Artists surveyed include: Lee Bontecou, Louise Bourgeois, Amilcar de Castro, Paul Cezanne, Lygia Clark, Kajsa Dahlberg, Stephan Dillemuth, Marcel Duchamp, Gardar Eide Einarsson, Gunther Foerg, Liam Gillick, Ferreira Gullar, Jean Helion, Eva Hesse, Jakob Jakobsen, Jasper Johns, Donald Judd, Wassily Kandinsky, Sol LeWitt, Piet Mondrian, Bruce Nauman, Helio Oiticica, Blinky Palermo, Lygia Pape, Mai-Thu Perret, Jackson Pollock, Tobias Rehberger, Bridget Riley, Emily Roysden, Lucas Samaras, Julian Stanczak, Frank Stella, Hito Steyerl and Theo van Doesburg. Writers include Alfred H. Barr Jr., Ina Blom, Lynne Cooke, Anthony Davies, Judi Freeman, Peter Halley, Joe Houston, Fredric Jameson, Lucy R. Lippard, Sven Lutticken, Nina Moentmann, Gabriel Perez-Barreiro, Catherine Queloz, Gerald Raunig, Irit Rogoff, Meyer Schapiro, Kirk Varnedoe and Stephan Zepke. Introduction; Formal Abstraction; Economic Abstraction; Social Abstraction; Biographical Notes; Bibliography; Index; Acknowledgements. Maria Lind is Director of the Tensta Konsthall, Stockholm, and a former Director of the Graduate program at the Center for Curatorial Studies, Bard College. A compendium of her essays, Selected Maria Lind Writing, was published in 2010.